Game 4 and another challenge in the form of another army of darkness - Vampire Counts. New Vampires have multitudes of options so it is not that easy to predict what the army will consist of. There are also so many new toys in the army list that despite the fact I have played some games against lords of undead there were still many mysteries for me to discover. 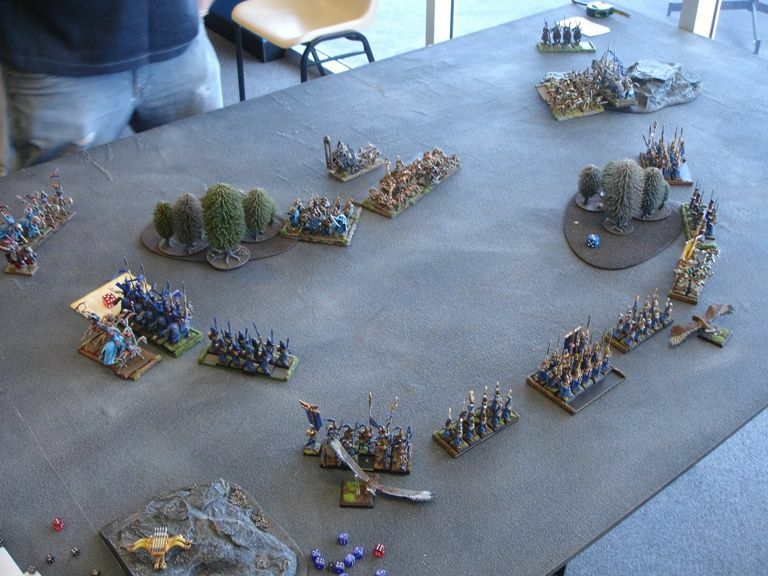 Kaleb, who came down from Sydney for that small local tournament and against whom I had a great pleasure to play against this time, had a mixture of classic approach and a few new units he added to his army. 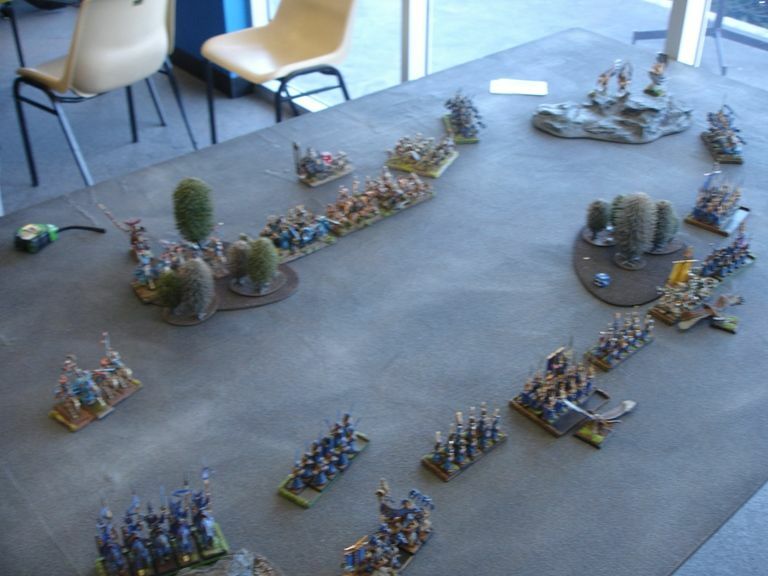 Quite a compact army, with very good magic and a nasty trick in the form of Always Strike First for all the units in 6" from Corpse Cart provided some spell is cast at it. New units were also going to be an interesting challenge, in particular I was looking forward to seeing hexwraiths in action. I had some tools against them, with Dragon Princes being almost immune to their attacks and one unit of swordmasters having magic attacks. The same unit would also be crucial in fighting the wraiths. Huge horde of ghouls would be a problem but I planned to shoot at them for at least 2 turns since their lack of armor would mean significant casualties even from bows. Of course magic of vampires could make it much more difficult to achieve but I'd rather them healing their units than attacking my own or casting van Hels to mess up with my movement phase. I also knew that if I managed to hit that regiment with 3 of mine then I might be able to kill them faster than they are resurrected. The danger was, however, in the fast they might be granted ASF and then the whole situation would be much more difficult. Vampire lord ordered his minions to stay close together so they could benefit from the Corps Cart special rule. Undead general stayed close to hexwraiths for the Look Out Sir! option if High Elves chose to shoot at him. Wraiths and Necromancer joined Grave Guard while Wight King led the horde of ghouls to battle all by himself. 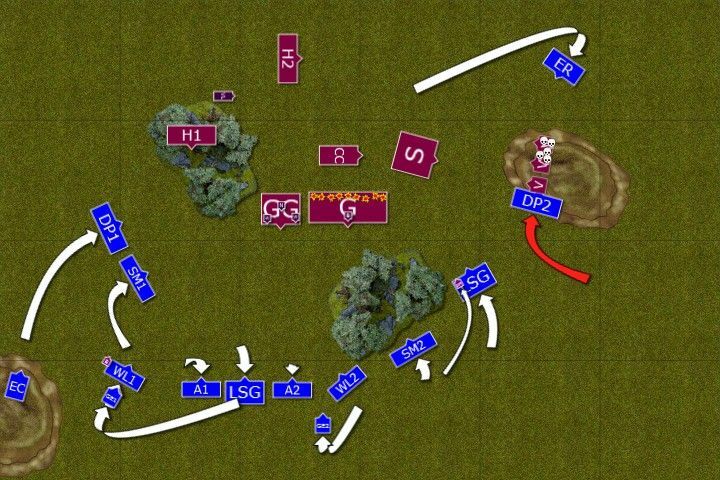 High Elves deployed wide as it is beneficial against more compact force with shooters occupying the center and hard hitters on the flanks. 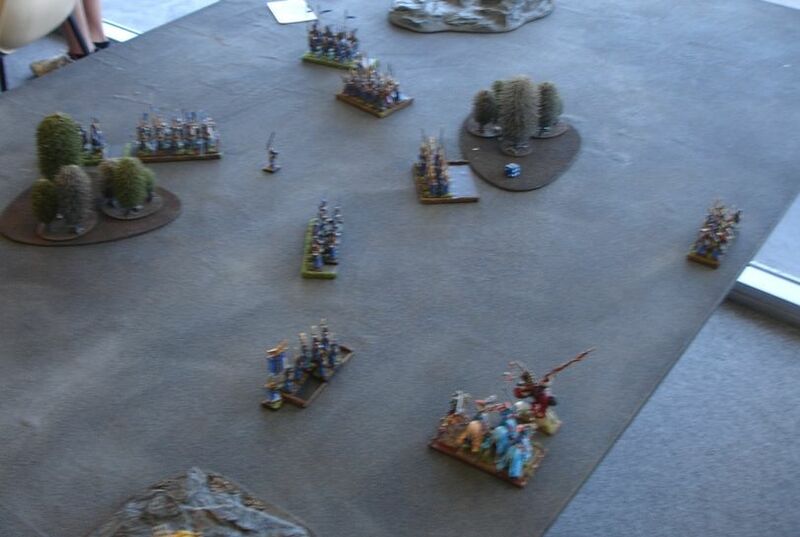 BSB was with Lions to be able to shoot hexwraiths while Archmage joined Swordmasters on the opposite flank where he was safe from the Vampire attention. Swordmasters with magic amulet granting them magic attacks were also deployed to counter hexwraiths or to engage grave guard and neutralize wraiths among them. Vampire Counts won the roll off and made the first move. Undead army moved forward as one guided by the iron will of their Vampire Lord. Only Vargheists moved on their own, looking for an easy prey. 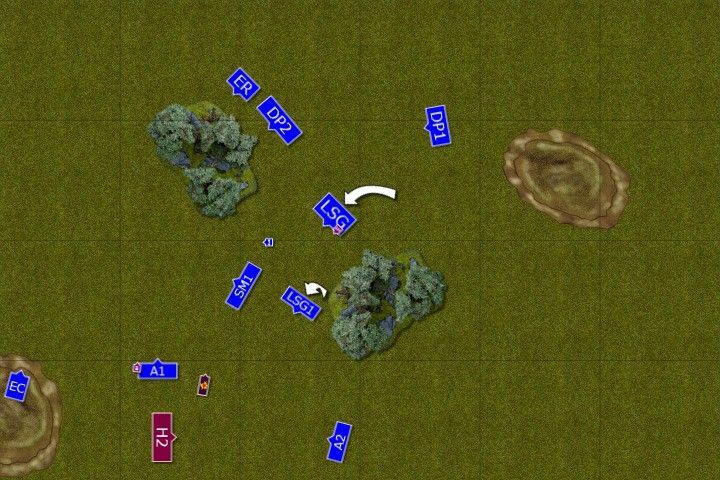 What looked like a steady advance was interrupted by magic feedback and a detonation caused by lowly necromancer. His orders were simple and he only wanted to obey but instead of invigorating the corpse cart and its dark energies he blew up quite a few grave guards. Not a good start and not a good sign for the future for a misguided adept of dark arts. Elven units begun their moves. 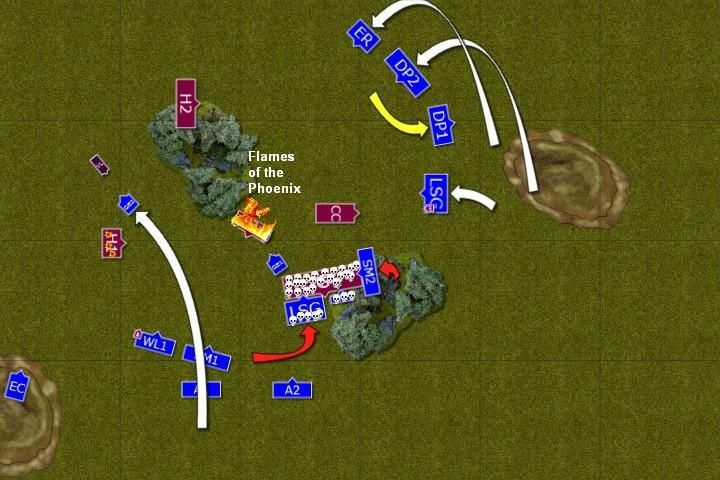 Swordmasters on the West attempted long charge but this time the foe was a little bit too far. 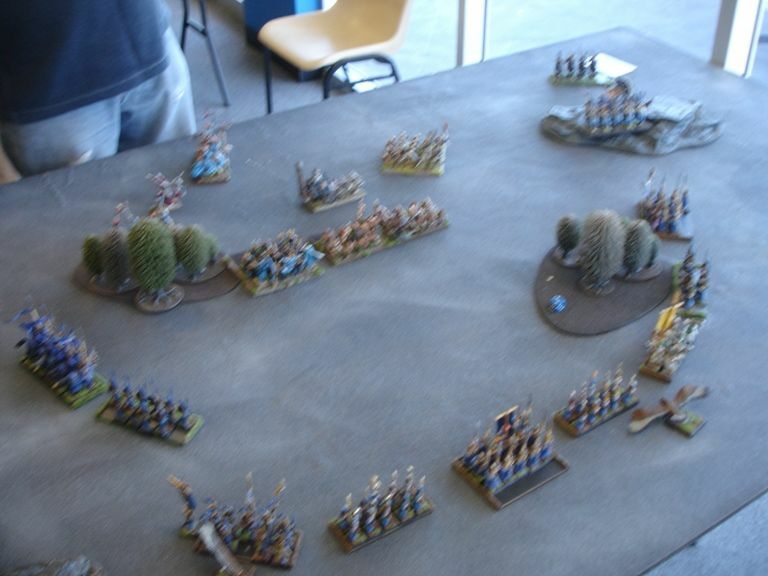 On the East Ellyrians raced towards the corpse cart with Dragon Princes covering their advance. Unholy device was also a target for Eagle Claw crew but somehow shaky construction proved more robust and huge bolt inflicted only minor damage. Sea Guard and Archers all focused on ghouls and entire rank of foul creatures fell truly dead. 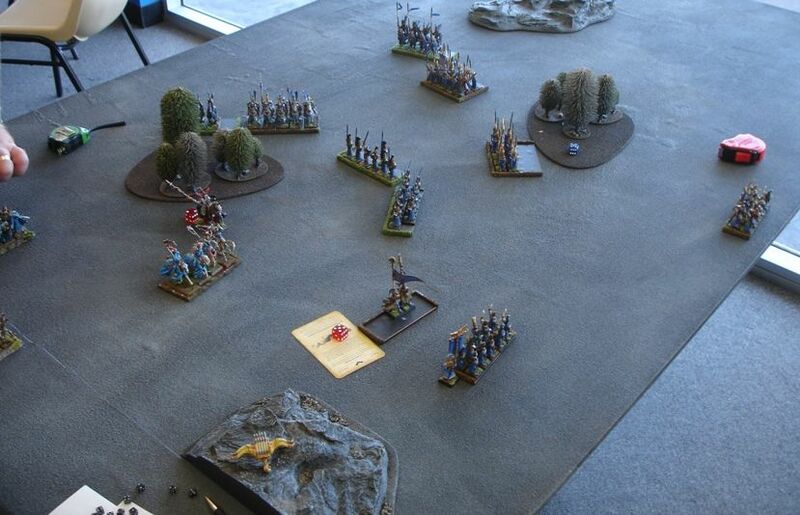 Not wanting to risk his ethereal cavalry Vampire Lord ordered mounted wraiths to withdraw and guard the Wester flank. On the East Vargheists charged Ellyrian Reavers but they were too swift even for flying monsters to catch. 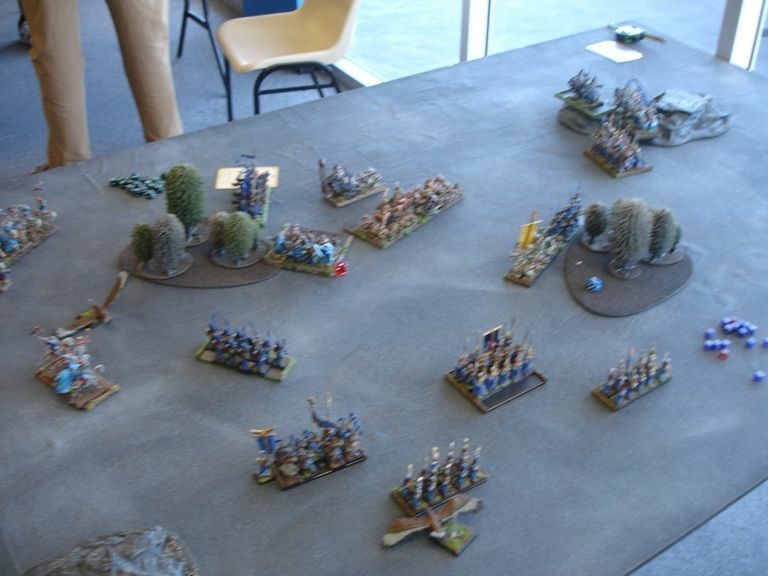 Elven light cavalry was also lucky to avoid magic bolts and only one unlucky reaver fell from the saddle. 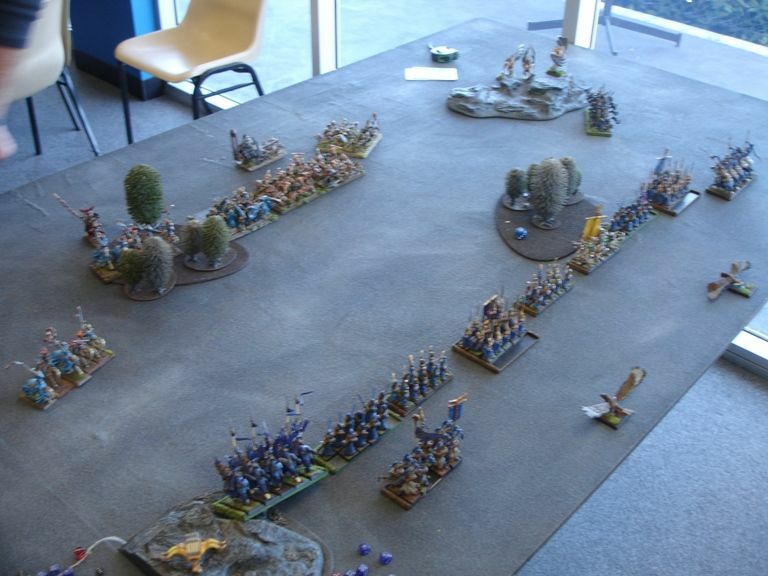 The rest of the army moved forward again with Skeleton Warriors changing the direction of march to meet elven forces ready to outflank undead. Dragon Princes, seizing the opportunity, charge the Vargheists. However, their steeds panicked and only with the greatest effort proud knights manage to still inflict some damage while their armor saves them from returning blows. 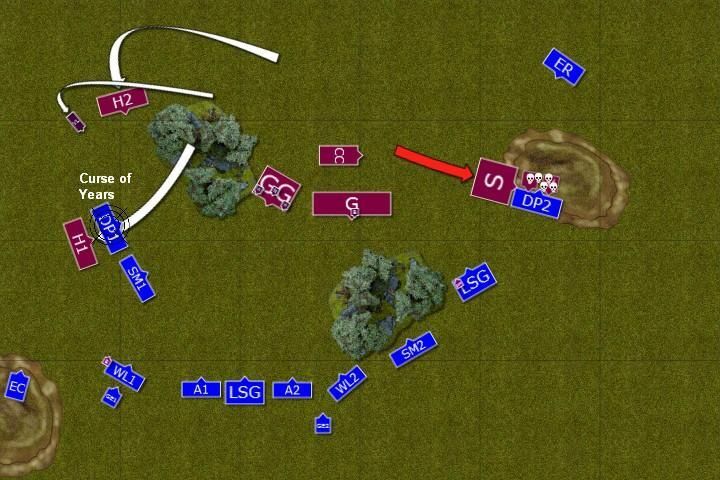 They were not locked in combat with dangerously exposed flank. 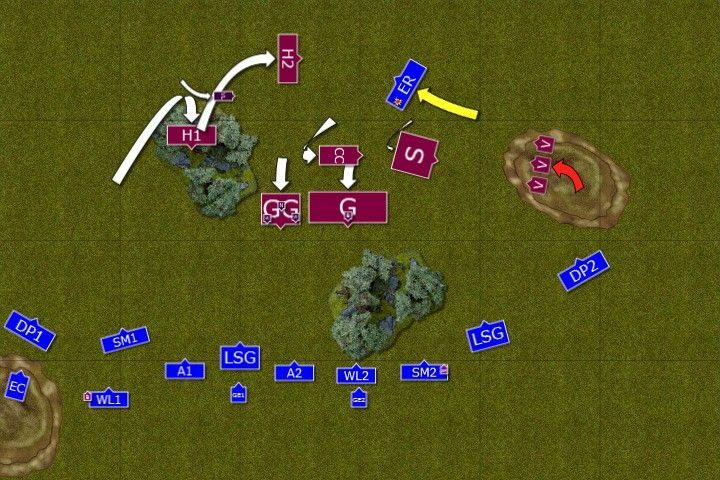 Other elven regiments exercised their well known envelopment while shooters pulled back a little and unleashed another volley. More ghouls were destroyed as a consequence and their numbers melted dangerously fast. Skeleton Warriors rush to aid Vargheists but this time elven knights strike with great skill and all remaining monsters are slain before they have a chance to strike back. Skeletons press hard but Dragon Princes maintain formation and even reform to face their new enemy knowing reinforcements are on their way. 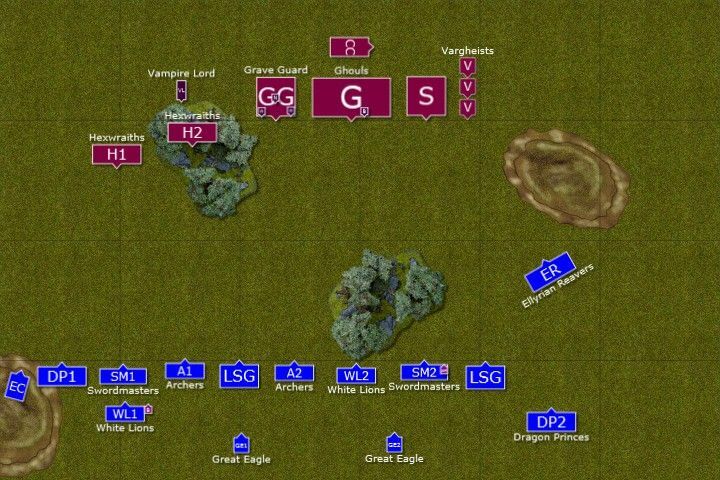 Regiments in the center stop their advance and Vampire Lord orders hexwraiths to go back to the Western flank to harass the enemy approaching from that direction. He also casts a curse on heavy cavalry but this time it brings no effect. Sea Guard and Ellyrian Reavers charge from both flanks of Skeleton Warriors and the whole regiment crumbles under the pressure of that simultaneous attack. 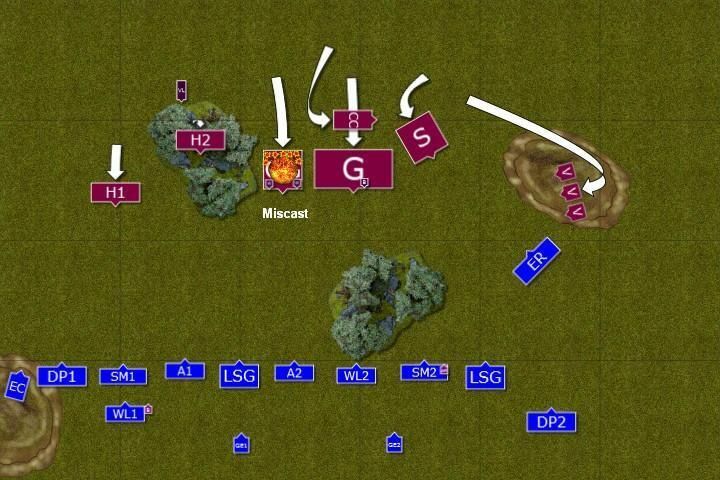 In the center Swordmasters and White Lions move forward to intercept ghouls (apologies for a little inconsistency between the picture and the diagram, they were not in the forest as you can see on the photo). 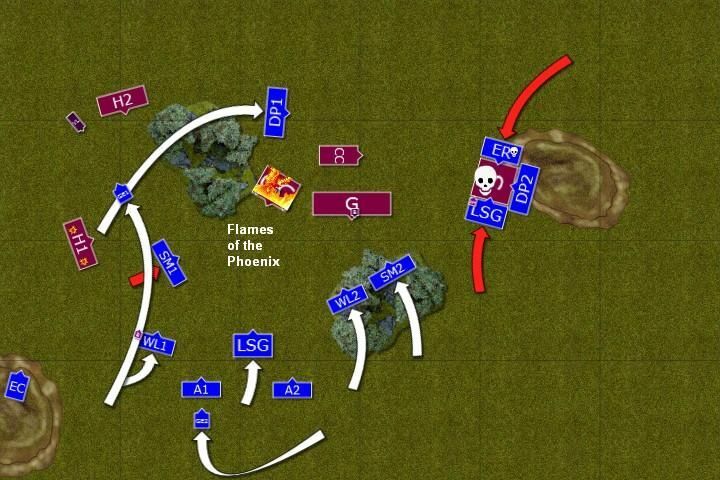 On the West Swordmasters tried to charge Grave Guard but seeing that the unit is engulfed in flames they stop their attack and let the enemy burn. The Archmage, now engaged in combat, had no opportunity to focus on dispelling dark energies but fortunately for Dragon Princes the curse didn't work again. 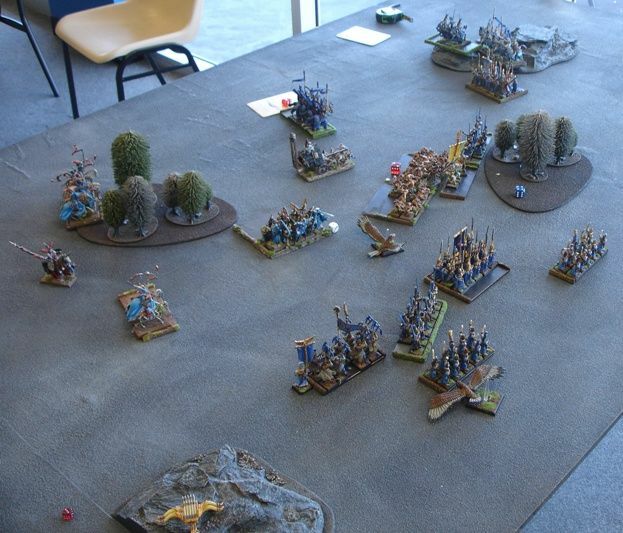 Vampire Lord ordered his troops to attack but elves didn't want to fight yet and withdrew. Only White Lions held their ground against ghoul horde and while suffered heavy casualties they held and even badly wounded the wight BSB who was barely capable of holding himself together to keep fighting. To add insult to injury potent curse of years still proved to be completely ineffective against Dragon Princes and none of the proud elven knights fell to the ground. 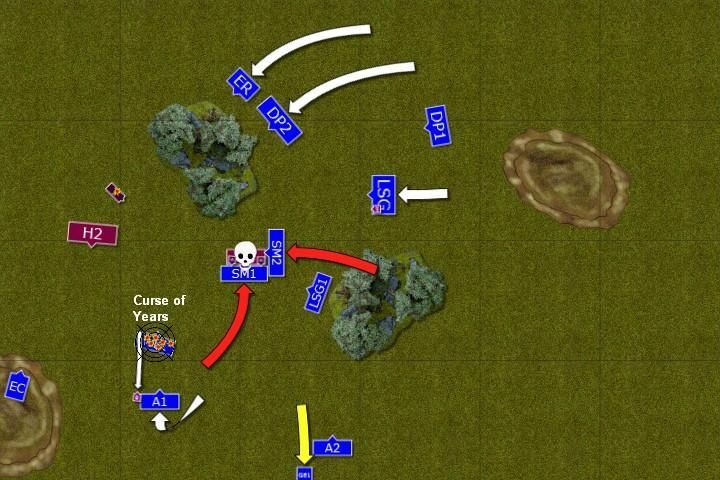 Swordmastes and Sea Guard counter charge without a delay and both units inflict such a devastating damage that only 5 ghouls remain standing after that round of combat. White Lions manage to finish off the Wight King BSB before they were torn apart by the ghouls and 5 more sea guards perish too. But the fate of that horde seemed to be sealed. Magic Flames kept burning the Grave Guard but this time wraiths seemed to suffer some damage. The units, however, was already depleted in numbers heavily. Grave Guard charge eagle which retreats but the proximity of burning undead warriors unnerves the archers and they decided to withdraw as well. 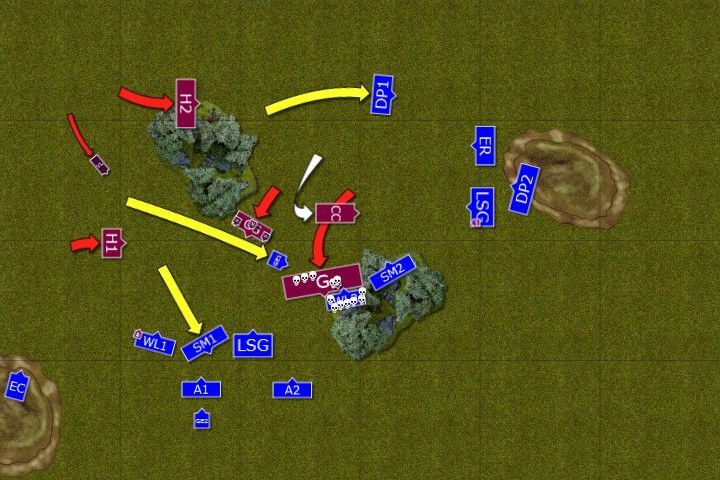 Grave Guard attempted to redirect their charge but they were not fast enough to reach their target - the Swordmasters. The Corpse Cart charges the flank of the Swordmasters fighting ghouls and two warriors of Hoeth die due to the sheer impact of that attack. However, that didn't save the ghouls and even the cart itself perishes when the dark magic that bind it together was dissipated. Vampire Lord in his fury charged and killed the eagle but it must have affected his focus as he suffered from the magic feedback. Although elven archmage was unable to stop another curse the remaining energy was immediately drained from the battle field and vampire lord could not cast any more spells. Swordmasters charged the Grave Guard but before they landed any blows all the undead warriors burned to the ground and only hapless necromancer remained for a second longer. 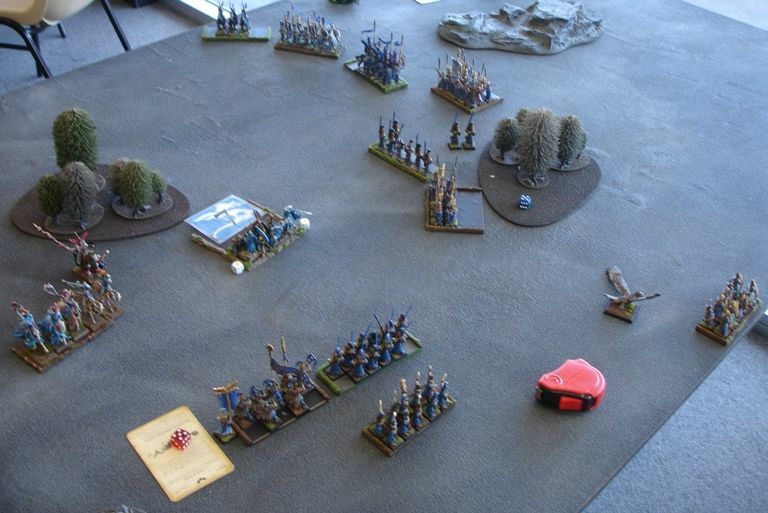 BSB aimed at incoming hexwraiths killing one while Eagle Claw carefully aimed at the exposed Vampire Lord. The bolt flew well and magic talisman of the night lord didn't activate but unfortunately the blow was not strong enough to finish the creature of the night once and for all. Elven Archmage attempted to break the curse but he failed and more Lions died, with the remaining few refusing to withdraw. 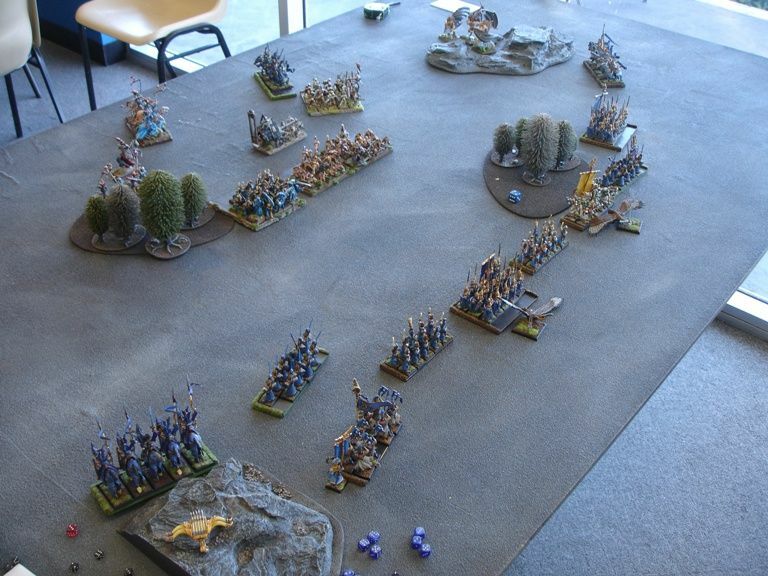 Vampire Lord moves away to relative safety to avoid any elven troops eager to attack him in close combat. 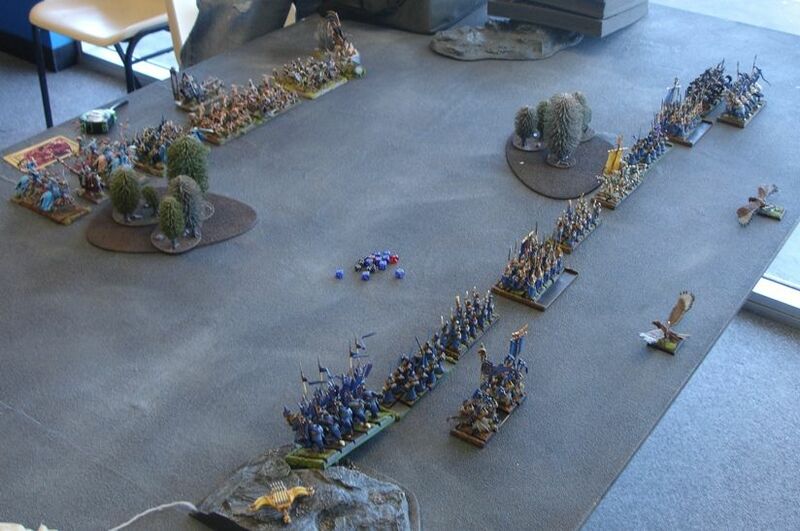 Hexwraiths move through lions and archers and they panic seeing horrible end of elite Chracians. BSB tries to stop them but it was clear they were too terrified to listen at this moment. 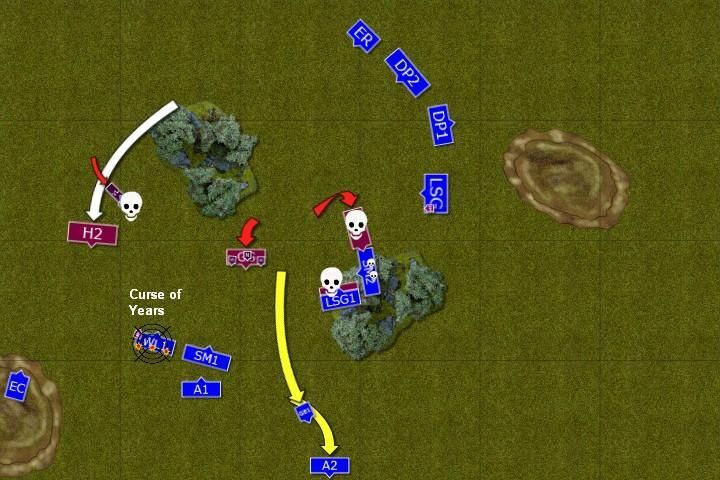 Vampire Lord enacts his last act of vengeance and kills all but one swordmaster from one of the regiments in the range. 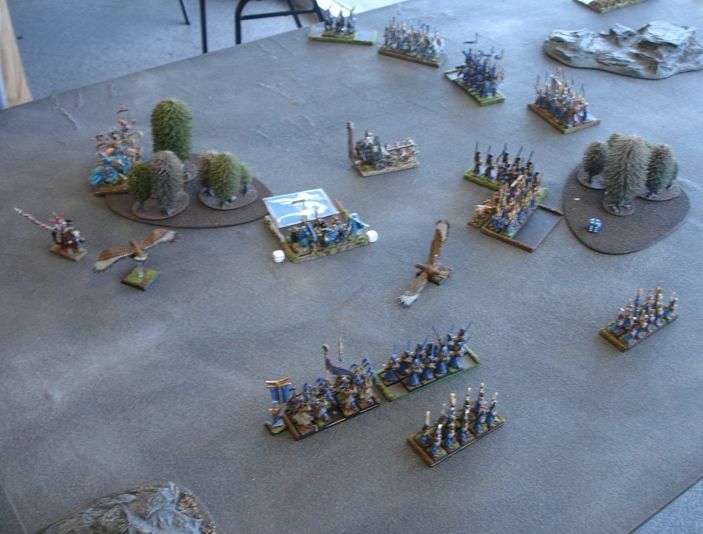 Since sneaky Vampire managed to escape the encirclement it was up to the Archmage and shooters to inflict some damage. Elven wizard summons the flames to hurt the hexwraiths but this time they didn't suffer any damage. Then the Archmage cursed Vampire Lord and Eagle Claw crew managed to hit and wound the lord of the undead but yet again he escaped the punishment. It was clear, however, that without an army Vampire Lord has to flee the battle and Elves were victorious. First of all I would like to thank Kaleb for a great and highly enjoyable game full of hilarious moments. We both forgot to dispel RIP spells at least once. I failed to dispel Curse on 3 dice (ending my own magic phase too), he could not roll well enough on 4 dice for 3 subsequent magic phases to kill even single Dragon Prince with his Curse of Years. Not to mention some miscasts when he first simply wanted to activate Crops Cart and then with his Vampire Lord when he really needed these extra spells. I consider myself very lucky that his magic didn't work this game as it would definitely change a lot. But I am mainly happy that my my blunder in turn 3 didn't cost me the battle :) Despite that I managed to secure 17-3 victory. 1. I was happy with the use of reavers and I liked the fact that they first baited Vargheists but then were there to help out too. It was unlucky to fail that fear test with Dragon Princes but it was more than balanced out by the fact they still killed the beasts and even held against Skeleton Warriors. 2. I hope I managed to show Reavers and Sea Guard versatility here. Reavers first fled to come back ready for action and their attacks were quite important in that combat against Skeleton Warriors, helping to crumble them down. Sea Guard was always active, adding arrows when needed and fighting very well. Their high number of attacks made them as dangerous as Swordmasters first against Skeletons and then even against Ghouls. What is more, their neglected 5+ armor save did matter in that combat. 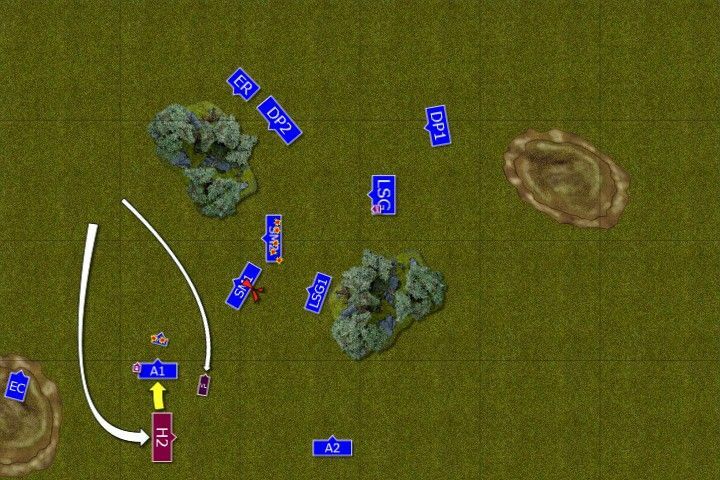 With narrow frontage they were still very maneuverable and I don't think I would be able to use archers in a similar way here. 3. 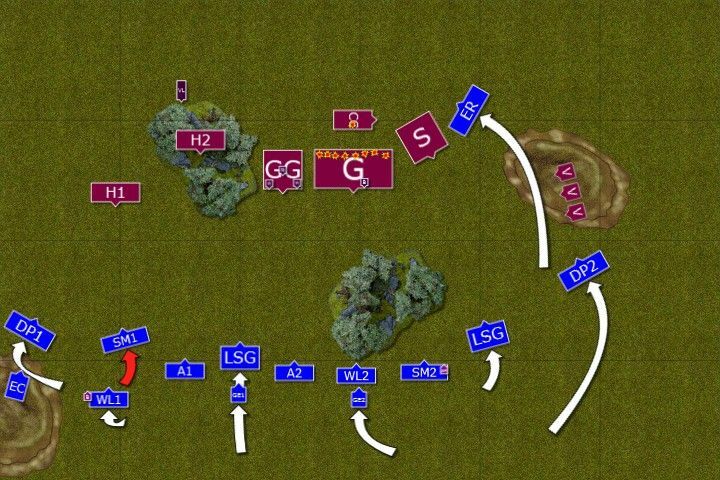 I really enjoy the way that army participates in every phase of the game, depending on what I need the most. I can start hurting the enemy turn 1, either with shooting and magic and that helps to finish even big units of enemy troops in combat. Kaleb told me that it was the first time he lost his ghoul horde. 5. I was happy with the deployment as I managed to block Hexwraiths. Kaleb didn't want to risk them to charge Dragon Princes since they could have been counter charged by Swordmasters. Sure, 2+ ward save can fail sometimes but I think it is understandable why he didn't want to risk it.